The purpose of this document is to educate affiliates on how CAKE tracking links work within different types of campaigns and with different types of pixels. 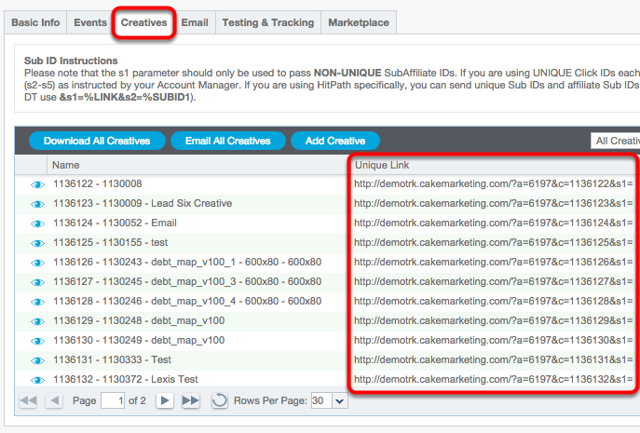 You may have been given a tracking link from your advertiser directly. If not, you can generate a tracking link from within the Affiliate Portal by opening the Offer card. From within the Offer card, click on the Creatives tab to access all available tracking links for this offer. On a CPC campaign, your advertiser has agreed to pay you on a "cost per click" model. Simply put, every unique click to the CAKE tracking link will result in a conversion. Please consult with your advertiser in regards to how they choose to track unique clicks based upon their attribution model. It's important to remember that a unique click in your platform may not be a unique click in your advertiser's system. With a CPC campaign, your advertiser will not be firing a pixel to determine a conversion and consequently will not be able to piggyback your pixel for this type of campaign. If you are running a CPA or revshare campaign for your advertiser, it is important to understand how tracking works inside of CAKE to ensure that you are properly tracking in your system as well. When the user converts, the CAKE conversion pixel will fire and will track a conversion if the cookie is still present on the user's machine. The CAKE conversion pixel will then piggyback your pixel so that you can track it in your system. Please consult with your advertiser to find out what type of pixel they are using. A Browser Pixel is a tracking pixel placed directly on the confirmation page. This is different from a server pixel, which is known as a Postback URL in CAKE. If you intend to implement a Postback URL pixel, commonly referred to as a server to server pixel, then you may already know what you need to include on the CAKE tracking link to ensure your Postback URL works. Postback URL's generally require a unique ID to be passed back to your platform that was originally generated by your platform. If this is the case, then you will need to identify a parameter on the CAKE tracking link to pass this value to your advertiser. Please note, you can not send a Click ID or any other unique ID from your platform to CAKE on the s1= parameter of the tracking link. Please use s2, s3, s4 or s5 to pass this information to your advertiser. Then, once you have identified this parameter, you can modify your Postback URL to receive this information back using the CAKE tokens. For example, if you choose to pass a click ID on s2=, then you will use the #s2# token on your Postback URL.